The top US intelligence authority issued an unusual public statement on Friday declaring it now believed the September 11 attack on US diplomatic facilities in Benghazi, Libya, was a "deliberate and organized terrorist attack." The statement by the office of Director of National Intelligence James Clapper acknowledged that it represented a change in the US intelligence assessment of how and why the attack happened. During the attack on two US government compounds in the eastern Libyan city, four US personnel, including Ambassador Christopher Stevens, were killed. 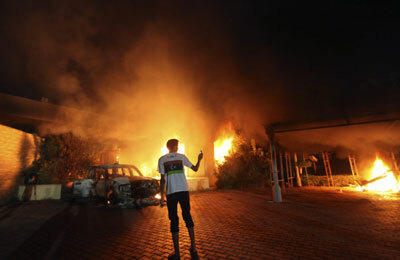 Shawn Turner, spokesman for Clapper's office, said that in the immediate aftermath of the attack, US agencies came to the view that the Benghazi attack had begun spontaneously after protests at the US Embassy in Cairo against an anti-Islam film. Turner said that as US intelligence subsequently learned more about the attack, "we revised our initial assessment to reflect new information indicating that it was a deliberate and organized terrorist attack carried out by extremists." He said it remained "unclear" if any individual or specific group commanded the attack. US agencies nonetheless believe that some of the militants involved in the attack were "linked to groups affiliated with, or sympathetic to al-Qaida." In an apparent reference to a series of contradictory statements by some top Obama administration officials, Turner said intelligence agencies' "initial assessment" had been passed on "to Executive Branch officials and members of Congress, who used that information to discuss the attack publicly and provide updates as they became available." One US official familiar with the background to the shifting intelligence assessments said the process of figuring out from scraps of intelligence who perpetrated an event like the Benghazi attack was "imprecise" and "evolving." Debate over whether militant groups planned the assault or whether the violence resulted from protests against the film insulting Islam has become US election-year fodder. Republican lawmakers have demanded answers about the incident from the Obama administration. Within hours of the attacks ending, some government sources in Washington were already acknowledging they might well have been planned and organized in advance, and that members of two militant factions, Ansar al Shariah and al Qaeda's North Africa-based affiliate, known as al Qaeda in the Islamic Maghreb, may have been involved. But top administration officials later made public statements that contradicted that assessment. On September 14, three days after the attacks, President Barack Obama's press secretary, Jay Carney, said the United States had no evidence the Benghazi attack was planned. Two days later, Susan Rice, the US ambassador to the United Nations, said preliminary information suggested the attacks were not premeditated and were protests against the anti-Muslim film that provoked demonstrations in Egypt. On September 19, Carney echoed Rice, saying, "Our belief based on the information we had was that it was the video that caused the unrest in Cairo and the video that — and the unrest in Cairo that helped — that precipitated some of the unrest in Benghazi and elsewhere." A day later, on September 19, Carney was still insisting, "Based on the information that we had at the time and have to this day, we do not have evidence that it was premeditated." But that same day, one key administration official moved back toward the assessment that the Benghazi assaults had been organized and intentional. At a congressional hearing, Matthew Olsen, director of the National Counterterrorism Center, part of the National Intelligence Director's office, labeled the assaults a "terrorist attack on our embassy" and said the United States was examining information that people involved in the attack had connections to al Qaeda or its North African affiliate. By the next day, Carney was asserting it was "self-evident that what happened in Benghazi was a terrorist attack."